Have you ever seen flying elephants? Well, a long, long time ago, elephants could fly. They had huge wings, the size of banana tree leaves. 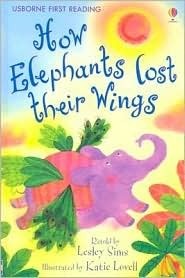 But flying elephants were a big trouble. They were NOISY. And MESSY. They were naughty and messed around everywhere, destroying the houses, trees, and fields. So one day, the gods played a trick and they secretly took their wings away. What happened to the wings then? Could the elephants ever got them back? This is a funny kid's fiction based no an Indian folk tale. With good illustrations and vibrant colors, this picture book is an easy reading text for kids. This book counts towards the The Picture Book Challenge 2011 hosted by There's a Book. If you want to sign up for the challenge, click here. and I do love me some folk tales. This looks so sweet! I bet my girls would love it!